For the state capital of Tamil Nadu, India, see Chennai. The original plat for Madras was filed on July 18, 1902, by Scandinavian immigrant John A. Palmehm, for whom the town was originally named "Palmain". The name was rejected by the U.S. Postal Service over its similarity to a post office named Parmen, and the name "Madras" was adopted, inspired by the cloth fabric of the same name, itself named for the city of Madras (now Chennai) in India. Madras was incorporated as a city in 1911. An Army Air Corps base was built nearby during World War II. This airfield now serves as [the Madras Municipal Airport]. Homesteads approximately 5 miles (8 km) north of the city on Agency Plains were based on dryland wheat. In 2003, a Scotts Company large field trial of GMO bentgrass near Madras resulted in pollen spreading the transgene, which is Roundup resistant, over an area of 120 square miles (310 km2). Because the grower could not remove all genetically engineered plants, the U.S. Department of Agriculture fined the grower $500,000 for non-compliance with regulations in 2007. The centerline of the path of totality of the Solar eclipse of August 21, 2017, ran very close to Madras. Because the city is located in a high desert environment and has consistently clear skies in August, it was considered a prime eclipse viewing location. All of the hotel and motel rooms in the area had been reserved for several years. The town had prepared for an influx of about 100,000 visitors for the eclipse. Madras is home to the Erickson Aircraft Collection, a privately owned collection of airworthy vintage aircraft. The collection is open to the public Tuesday through Sunday, 10 a.m. to 5 p.m. The Jefferson County Fair is held on county property along Fairgrounds Road in Madras. The annual fair takes place in late July. According to the United States Census Bureau, the city has a total area of 5.02 square miles (13.00 km2), all land. Madras has a steppe climate (BSk) according to the Köppen climate classification system, also known as semi-arid. As of the census of 2010, there were 6,046 people, 2,198 households, and 1,430 families residing in the city. The population density was 1,204.4 inhabitants per square mile (465.0/km2). There were 2,569 housing units at an average density of 511.8 per square mile (197.6/km2). The racial makeup of the city was 66.4% White, 0.7% African American, 6.9% Native American, 0.8% Asian, 0.2% Pacific Islander, 19.7% from other races, and 5.4% from two or more races. Hispanic or Latino of any race were 38.5% of the population. There were 2,198 households of which 41.2% had children under the age of 18 living with them, 42.5% were married couples living together, 15.9% had a female householder with no husband present, 6.6% had a male householder with no wife present, and 34.9% were non-families. 28.5% of all households were made up of individuals and 11.2% had someone living alone who was 65 years of age or older. The average household size was 2.69 and the average family size was 3.31. The median age in the city was 31.2 years. 30.8% of residents were under the age of 18; 10.4% were between the ages of 18 and 24; 27.1% were from 25 to 44; 21.6% were from 45 to 64; and 10.3% were 65 years of age or older. The gender makeup of the city was 49.3% male and 50.7% female. As of the census of 2000, there were 5,078 people, 1,801 households, and 1,251 families residing in the city. The population density was 2,326.9 people per square mile (899.4/km²). There were 1,952 housing units at an average density of 894.5 per square mile (345.7/km²). The racial makeup of the city was 63.55% White, 0.59% African American, 6.14% Native American, 0.55% Asian, 0.35% Pacific Islander, 24.56% from other races, and 4.25% from two or more races. Hispanic or Latino of any race were 35.74% of the population. There were 1,801 households out of which 41.0% had children under the age of 18 living with them, 49.2% were married couples living together, 12.9% had a female householder with no husband present, and 30.5% were non-families. 25.3% of all households were made up of individuals and 9.2% had someone living alone who was 65 years of age or older. The average household size was 2.78 and the average family size was 3.32. In the city, the population was spread out with 33.1% under the age of 18, 10.6% from 18 to 24, 29.7% from 25 to 44, 16.1% from 45 to 64, and 10.5% who were 65 years of age or older. The median age was 29 years. For every 100 females, there were 95.3 males. For every 100 females age 18 and over, there were 94.8 males. The median income for a household in the city was $29,103, and the median income for a family was $33,275. Males had a median income of $27,656 versus $19,464 for females. The per capita income for the city was $12,937. About 15.2% of families and 19.6% of the population were below the poverty line, including 26.3% of those under age 18 and 10.0% of those age 65 or over. ^ a b "US Gazetteer files 2010". United States Census Bureau. Archived from the original on 2012-07-14. Retrieved 2012-12-21. ^ "Certified Population Estimates for Oregon's Cities and Towns" (PDF). Population Research Center. Portland State University. March 2009. Retrieved 2009-07-29. ^ "How did Madras get its name?". The Bulletin. Aug 20, 1958. p. 21. Retrieved August 18, 2015. ^ Templeton, Amelia (July 17, 2012). "Madras, Almost Named Palmain, Turns 100". Oregon Public Broadcasting. Retrieved August 22, 2017. ^ Elliott, Hannah (July 20, 2017). "A Tiny Oregon Town Is Prepping to Be Ground Zero for Eclipse Tourism: Madras, Ore., has a high elevation and wide open spaces with no light pollution, so it's excellent for eclipse tourism. But it has a population of just 6,000; where is everyone else going to sleep?". Bloomberg News. Retrieved July 29, 2017. ^ "Erickson Madras - Erickson Aircraft Collection". Erickson Aircraft Collection. Retrieved 19 April 2018. ^ a b "Fairgrounds". Jefferson County. 2018. Retrieved October 18, 2018. ^ "MADRAS, OR (355139)". Western Regional Climate Center. Retrieved November 26, 2015. ^ Moffatt, Riley. Population History of Western U.S. Cities & Towns, 1850-1990. Lanham: Scarecrow, 1996, 212. 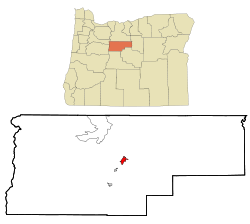 ^ "Subcounty population estimates: Oregon 2000-2007". United States Census Bureau, Population Division. 2009-03-18. Archived from the original (CSV) on 2009-05-15. Retrieved 2009-04-29. ^ "Jacoby Ellsbury Stats - Baseball-Reference.com". Baseball-Reference.com. Retrieved 19 April 2018. ^ "1957 Special Session (49th): October 28-November 15", Oregon Legislators and Staff Guide, Oregon Secretary of State, Salem, Oregon, accessed 1 February 2016. ^ Levitt, Shelley (November 15, 1993). "River's End". People. Time. Retrieved April 24, 2017. 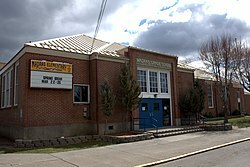 Wikimedia Commons has media related to Madras, Oregon.